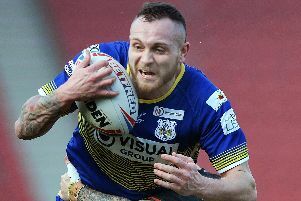 Doncaster RLFC will be without influential skipper Kyle Kesik in tomorrow’s crucial League One home clash against Newcastle Thunder at the Keepmoat Stadium’s athletics arena (3pm). The sixth against fifth clash could prove to be vital in the race for a top four finish, ahead of the forthcoming Super 8s. “Kyle’s hamstring is still tight so we have decided not to risk him,” said new head coach Richard Horne, who will be taking charge of his first home game. Kieran Cross (inset), who produced a series of outstanding displays standing in at half-back before tearing shoulder muscle back in March, will come in for Kesik on his return to action. “We’ve no need to risk players when we have fit players champing at the bit,” Horne told The Star yesterday. The Dons will also lack prop Feka Paleaaesina, who Horne feels needs to work on his fitness after making a mixed return after a month on the sidelines at Workington last week. Fit-again winger Sam Doherty will come back into the side but there is no place in the side for centre Liam Welham as a result of an impressive two-try debut by dual-registered Hull FC prospect Jack Logan. The Dons dropped to sixth following the defeat at Derwent Park. However, victory over fifth-placed Thunder and a defeat for York away to unbeaten leaders Toronto Wolfpack today would see them move level on points with the Knights with a game in hand. “This weekend could prove to be the turning point in the battle for fourth place with just two weekends of the regular season to go,” said Horne. “We are looking forward to the game but we aren’t treating Newcastle lightly. “They’ve got some experienced players and some good young players looking to make a name for themselves. “They’ve also got a good kicking game. “I want us to build on the improvements we saw at Workington, particularly around the ruck. “I want us to spend more time in their 20 than we did last weekend.